I wonder what the Zombie Rights Campaign would think about LURCH! 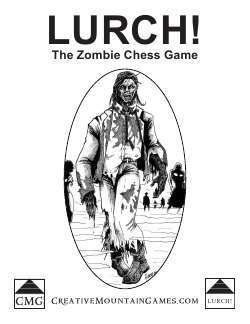 The Zombie Chess Game. I get the feeling that they might think of zombies fighting zombies as exploitation. Nevertheless, no real zombie are ever hurt in a game of LURCH! Still, check out their website. They have lots of humorous takes on the whole zombie situation and taking advocacy beyond the grave. Then play some LURCH!